Situated in a disused toilet complex, this gallery is a non-profit making space showcasing the works of young artists working in the fields of art, music, film, video, installation and performance based work. Art was based on/around each cubical space provided – essentially, each cubical was be ‘hijacked’ by the artist. The cubicles acted as temporary spaces to exhibit each artists unique work/mind. These were all new commissions / works unique to Guerrilla Zoo. 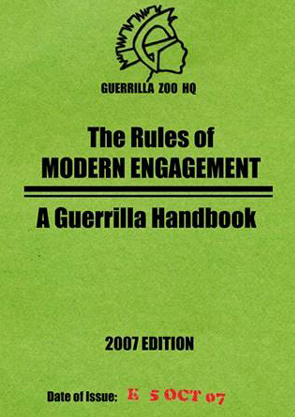 Guerrilla Zoo became a creative part of the community around Kingston for our 3 week long hijack. We offered a programme of mixed media events and workshops. We hoped to have helped further, develop and extend local interest in such areas as; music, art, performance, movement, creative writing, counter-culture subversion / art activism, and so on. The variety of what was on offer created a diverse audience and hence raise the awareness and exposure of all the artists involved.